At Infi we’re trying to create an environment of continuous learning. One of the things we do is do a period of studying with your co-workers once every year. 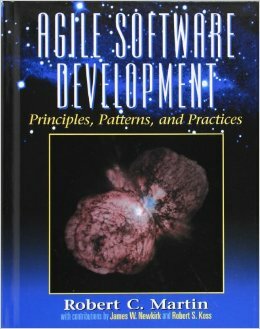 The subject can be anything related to software development, and this year we chose to study Uncle Bob Martin’s excellent book Agile Software Development, Principles, Patterns, and Practices. I define accidental design as a design that’s present in a software system, but was not consciously chosen for. Instead, it’s driven by other factors, such as tooling, co-workers, past experience, existing code and a whole lot of other reasons. Two of the most common cases I encounter have to do with the special case pattern and primitive obsession. For this blog post I’ll use examples from the Payroll Case Study. Instead, we would probably design something to handle the special case of an empty set result explicitly, be it by an IntResult, use a TryGetMax method or making the returned int nullable. The latter might seem contradictory, but the point is that our code makes explicit that we will not always be able to get a maximum value from an int set. In this case we have actually thought about representing the real range of results, whereas by just defaulting to return a null whenever an edge case occurs, we haven’t. The latter situation is accidental design since we did actually make a design decision, but not consciously. How often have you introduced bugs because you mixed up the order of the parameters, and accidentally mixed up the salary and the commission rate? I can say I have. Also, what is the commission rate expressed in, is it a percentage or fraction? What if we want to change the representation of the percentage commission rate to an int? We’ll have to track and change it everywhere. This way, type safety would prevent us from mixing up the parameters, we can create nice explicit factory methods on our Salary and CommissionRate classes, and changes in data representation would be local to those objects only. Besides that, aren’t we told in high school that an number without a unit is meaningless? Again, this is accidental design at work: our environment provides us with these primitive types, so we tend to use them. These primitive types, however, are not designed by you. Had they been different, your design would’ve been much different. How much of that would you be comfortable with? One more example of this is the lack of a Date type in .NET. Because of this we tend to represent all dates as DateTime’s. This has caused me headaches in more than one project, and could’ve been mitigated had we created a Date type ourselves (it’s even worse when you deal with Unix timestamps). Accidental design might sound like a bad thing in general, but to be honest I actually think a lot of design “decisions” are made that way. If it wasn’t, we’d probably never ship. Still, I think it’s good practice to be aware of as many of them as you can, and know your options when you actually do need to make something more explicit. Other areas where I see a lot of accidental design (or architecture) are choices for languages, frameworks and database technology. I might write about those in a later post. With regard to the examples: In the case of GetEmployee method, it might actually be a pretty good convention to return null when the specified Employee couldn’t be found. But by being a convention, it’s actually become a conscious decision. Also, an argument I’ve heard against wrapping every primitive is that it introduces needless complexity and a reduced overview of your project due to the proliferation of classes. Those are sound arguments, but in my experience they don’t weigh up against the benefits.